No one expects to be seriously injured going to work at a grocery store, or in a nurturing career like nursing or teaching. For most people, the idea of occupational injuries brings to mind high-risk fields like construction or law enforcement. So it may come as a shock to learn that nearly 20% of all private industry injuries occur in the retail sector – an industry considered fairly low risk – and that the average rate of overexertion injuries for hospital workers is double that of all other industries. Whether it’s at a supermarket or a clothing store, cashiers deal with a myriad of workplace hazards Cashiers are required to make repetitive motions, such as scanning and bagging items, consistently through the workday. These motions can lead to repetitive stress injuries like carpal tunnel. Standing in place at the cashier station is also taxing on workers, and can lead to foot, leg, and back injury. This phenomenon is also seen in other occupations where standing for 8 hours a day is common, such as bank telling. Employers are recommended to instate ergonomic measures such as foot rests and anti-fatigue mats, as this can help increase comfort for cashiers who must stand for hours at a time. Helping cashiers to avoid awkward and twisting hand motions by making items easy to scan, and allowing workers to scan heavier items without lifting them, also helps to reduce potential injury. 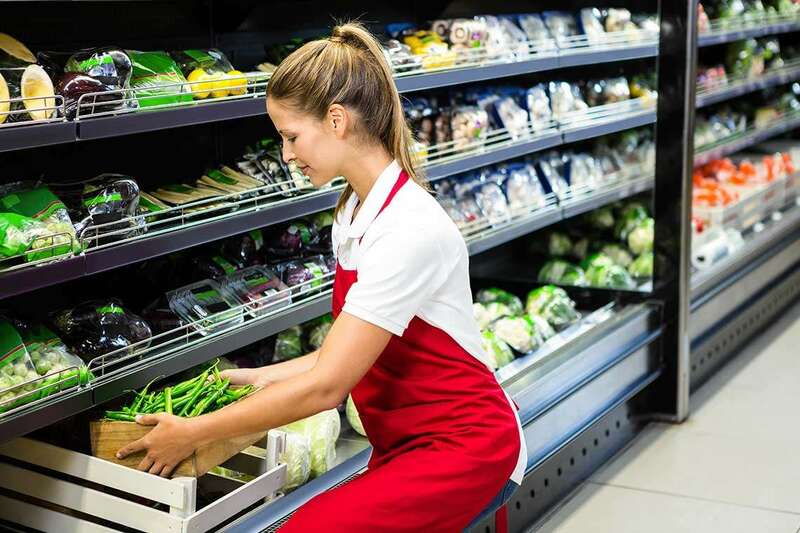 Grocery stockers face two main types of workplace injuries common to their job: overexertion due to heavy object handling and repetitive stress injury from stocking shelves. Knee pain is also common, as stockers are required to stock low shelves as well. One of the best ways for grocery stockers to avoid repetitive stress injuries while stocking is to use a stocking cart at elbow height, so excessive bending and twisting is avoided. Knee pads are recommended while stocking low shelves. Employers can reduce heavy object handling injuries by ensuring suppliers provide lower weight boxes – preferably 40 pounds or fewer – which can be more easily handled by employees. Employees should also follow safe lifting procedures and be sure to lift from the knees and never bend at the waist while lifting. Maintaining carts, which employees use to transport items through the supermarket, is also important, as old and rusty carts can be difficult to push and result in overexertion over time. These unexpectedly risky jobs are not just limited to retail. Health care shift workers also face unexpected dangers on the job. In fact, hospitals are considered one of the most hazardous places to work, according to the Occupational Safety and Health Administration. Nurses and other healthcare shift worker frequently suffer from musculoskeletal disorders, particularly back pain, because of the heavy lifting they must do when handling patients. Nurses must also stand through long shifts, which can exacerbate this back pain. Hospitals are recommended to invest in equipment so that nurses can safely handle patients without overexertion. Not only does this prevent musculoskeletal disorders, but patient handling equipment also benefits patients, who feel a greater sense of dignity than if they were manually lifted by a healthcare worker. Schools are expected to be safe places for students and staff alike, but teachers are also subjected to many workplace injuries. In addition to foot, leg, and back pain caused by standing for long periods at a time in front of the classroom, teachers are at risk of carpal tunnel syndrome. Carpal tunnel syndrome can be caused by common teacher duties such as grading tests and homework. Ergonomic adjustment of a teacher’s desk can help with some of this wrist strain. Teachers also face the unique challenge of workplace violence. During the 2011–12 school year, 9 percent of teachers reported being threatened with injury by a student and 5 percent were physically attacked by a student, according to the National Center for Education Statistics. Schools must seriously address the consequences of violence against teachers with students, and create an environment where teachers are comfortable reporting instances of bullying and assault. These occupations may come with increased safety risks due to the responsibilities required of workers, but employers should create workplace safety measures where possible to reduce the potential for musculoskeletal disorders and other debilitating injuries and illnesses. A safe workplace not only reduces injuries and workers’ compensation claims, but helps employees to provide their best service for customers, patients, and students. If you suspect you have developed an injury due to your employer not instating safe workplace policies, read more about workers’ compensation claims and contact us for a no-risk free case evaluation.